A budget-cutting local authority boss doubled the amount of cash he claimed back from taxpayers for expenses in just three years. Orkney Islands Council chief executive Alistair Buchan was repaid £7,353 for meals and travel taken in 2017/18, up from £4,827 in the year before, and the £3,640 he claimed in 2015/16. His bill for last year was higher than the total spent over three years by the head of Shetland Islands Council. NHS Shetland chief executive Ralph Roberts was the only other public sector boss in the north and north-east to claim for more money than the year before, increasing slightly from £1,324 to £1,470. In comparison, spending by the top officials at NHS Highland and NHS Grampian was slashed by two-thirds in the last three years, while it was halved by the head of NHS Orkney. 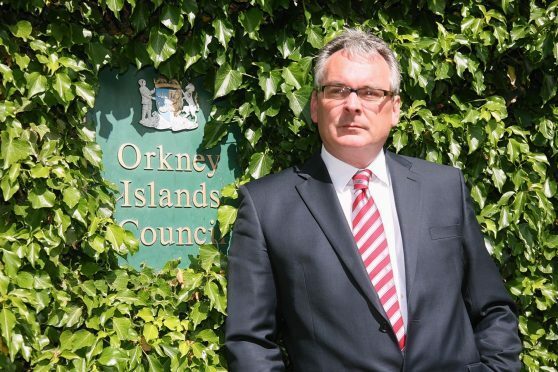 Mr Buchan – who has been in charge at Orkney Islands Council while £11million was cut from spending on services over the last six years – claimed about £15,500 between 2015/16 and 2017/18. It was the highest bill of all 13 local authority and health board bosses in the region, according to their responses to freedom of information requests from The Press and Journal. He forked out £2,300 on more than 100 meals – including 26 business dinners and lunches worth a combined £1,223 – as well as close to £900 for taxis, and the highest mileage claim of all the chief executives. His £11,000 driving bill meant he clocked up almost 25,000 miles in the period – including nearly £5,000 for almost 11,000 miles last year alone. It represented almost as much mileage money as the combined total claimed by the top officials at Aberdeenshire, Highland, Western Isles and Shetland Islands councils. NHS Western Isles chief executive Gordon Jamieson racked up a total of £13,010 in the three years, the second highest total, including spending £7,238 on hotels and meals. 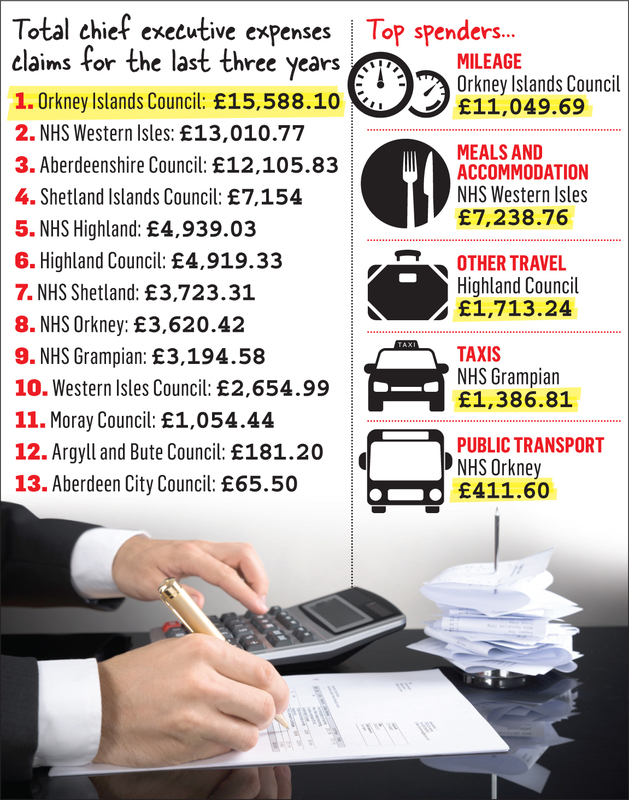 Mr Jamieson’s bill for accommodation and food represented more than the combined total claimed in that category by the chief executives of NHS Orkney, NHS Shetland, NHS Grampian and NHS Highland. Liz Gordon, regional officer for the GMB trade union, said the spending on “high dining” was an “insult to the taxpayer and hard-pressed staff”. She added: “It seems chief executives are still living the good life despite the constraints of austerity. However, a spokeswoman for Orkney Islands Council, which Mr Buchan has led since 1997, said: “As a local authority representing an island community we will always face considerably higher costs compared with councils on the Scottish mainland, when travelling to essential business meetings and different councils have entirely different systems for car use so comparisons can be extremely misleading. “Our island chief executive usually travels by ferry and car for medical reasons, hence the higher figure for mileage which would otherwise have been spent on air fares. “However it is worth noting that we are not comparable with our fellow island authorities either in terms of our travel challenges – with ferry journey times of less than two hours from Orkney to the mainland and a relatively straight forward road network to follow that, a car journey to our destination is much more achievable for us than for our colleagues in Shetland or the Western Isles– and usually works out cheaper than a flight. Mr Buchan was paid £6,275 in expenses last year, but actually spent an additional £1,078 in 2017/18, although that money was paid to him this year because the claims were submitted late. A spokeswoman for NHS Western Isles said: “Chief executive travel consists of monthly journeys to the mainland, to any of our own three islands for work or service related meetings, and national working, which will involve air and/or ferry, road travel and overnight stay where necessary. “Video conferencing, where available and appropriate, is used to minimise such journeys.